Thorns – Goat Head – I'm sozoed! You gotta read Luke 8:4-15 – Then take a look at the pictures. 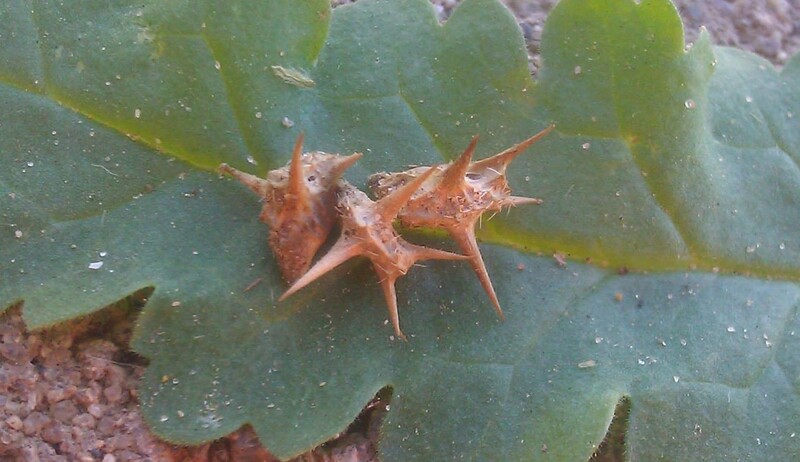 Notice how these goat head thorn plants (Tribulus terrestris) take over a space. All the other plants are pretty much choked out and the plants that are living among these horrid creatures are pretty frail and vulnerable. I can see how bearing mature fruit, fruit that is ripe, fruit that is bursting with flavor; fruit that overflows our senses is virtually impossible in thorn rampant conditions like this. All the nutrients are being consumed by the thorns and robbing from the other plants, placing them in survival mode. I want to be a fruit factory, producing mature fruit that is bursting with the flavor and aroma of Christ! I want to be in full production, not barley surviving! Getting rid of these goat heads is going to take some work. Seems almost impossible. All of it will need to be removed. Some will try to come back but now that we know what these nasty things look like we can “nip em in the bud” – pick’em at the root and eventually this space will recover providing the soil necessary for the native grasses, sages and plants to reestablish. Father, we want to be yoked to You! Not choked by the cares, riches and pleasures of this life! You know what is uniquely specific to each of us to clean out the thorns so we can grow richly and spiritually nutrient dense in You, bearing robust, flavorable ripe fruit, emitting the aroma of Christ! We open up fully to You to live as new creatures in what your created us to be! Cultivate us Holy Spirit!! !